English: I am the only wolf. Rina despises perverted guys. She can't seem to find the prince she so desperately seeks, that's before she meets the new transfer student, Jin Ookami. Behind his hair, she discovers the face of her prince. The truth is, he was raised by a wolf, and his seemingly perverted actions for the most part are innocent instincts. How will Rina deal with the new object of her affection, when said person is a true wolf? Is this the beginning of true love? 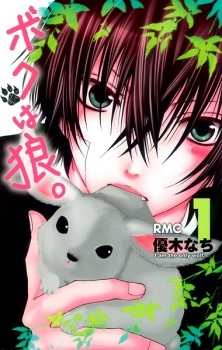 Boku wa Ookami was published in French as I'm the only wolf by Soleil Manga from February 5, 2014 to February 4, 2015. What the everloving crap did I just read? This was the B-movie of shoujo manga - you're either going to love it because it's so utterly bizarre and is one of those things that make you go, "Oh Japan, you're so lovably crazy," or you're going to come away feeling like someone just stuck the most mediocre shoujo tentacle possible through your ear into your brain and wiggled it around for a while. The premise is slightly weird and is taken to stunningly weird extremes by the unrealistic actions and reactions of the characters. Other than that, this manga laps up every single shoujo manga trope and shoehorns them in with hardly a smidgen of originality despite the initially odd premise. Normally, I would not dare to comment on a Shoujo manga such as this due to my pride as a man, but even I can not ignore the comedic genius of having a plot involving the main heroine despising men due to the fact that they are all "Wolves" so to speak. Now lets have this heroine meet a man that she instantly falls in love with, but this man is a little strange, now as an early plot twist, lets say that this strange man was literally raised by wolves. I can not wait to see the mishaps and misunderstandings that this manga will undergo. Normally I don't read much romantic manga's, but this was a really good choice too read. I have read this manga in 1 day straight, I really loved it. I think its diffrent then other romantic manga's this is more funny written then romantic. The manga is funny and very sweet and not a long manga that gets bored after a while (what I really like). The story is very orignal (my opinion) and is full of funny moments, sweet love moments and a good love story. A shy and unsure together with a wild, silly wolf. Was good and easy too read. Sometimes less detailed then other times. but for me is the story more important. I like the characters mostly the boy beceause he makes the story much more fun. Liked, loved, laughed of this manga. I even felt a little jelly (was so sweet). This manga was really good! I love romance anime/manga and I'm surprised this manga isn't on a higher list. I loved it and it's really good! It's a shame though that is it kinda short. I feel like the story could make into a really good anime later on. Just a shame it's to short! The ending felt a little rushed tbh. Would of been better if there was more backstory and maybe more character development. I would of liked to have more chapters because I enjoyed reading it so much! I was alittle disappointing how one of the characters was treated like and would of liked to seen a better ending with him. Though I would highly suggest you reading this if your looking for a somewhat short romance manga.